The skies were grey and a large cloud hung low, threatening to burst. My boys were antsy for an activity, and I’d already throughly explored the antique mall while they played laser tag the day before. My parents suggested we make a trip down to Dover, Ohio to visit the Warther Museum. 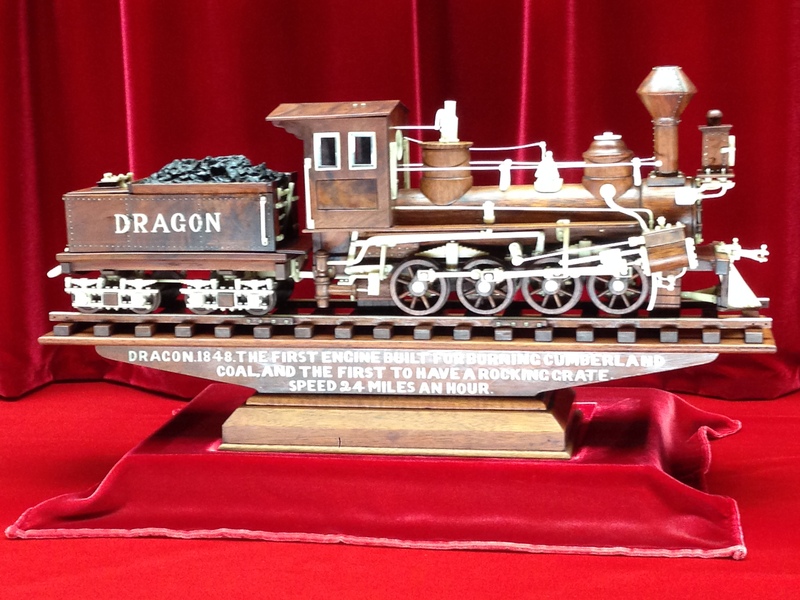 Ernest “Mooney” Warther was a master woodcarver who made over 200 models of trains in his lifetime yet made his living making hand crafted cutlery. Knives were involved; the boys were in. Passion was something that Warther embodied. Whether whittling small pliers to give to children, postcards, or link chains, his knife was never out of his hands. But trains were what made him tick. Painstakingly done to scale, he was a mathematical genius making all his models not only exactly to scale but with all moving parts. 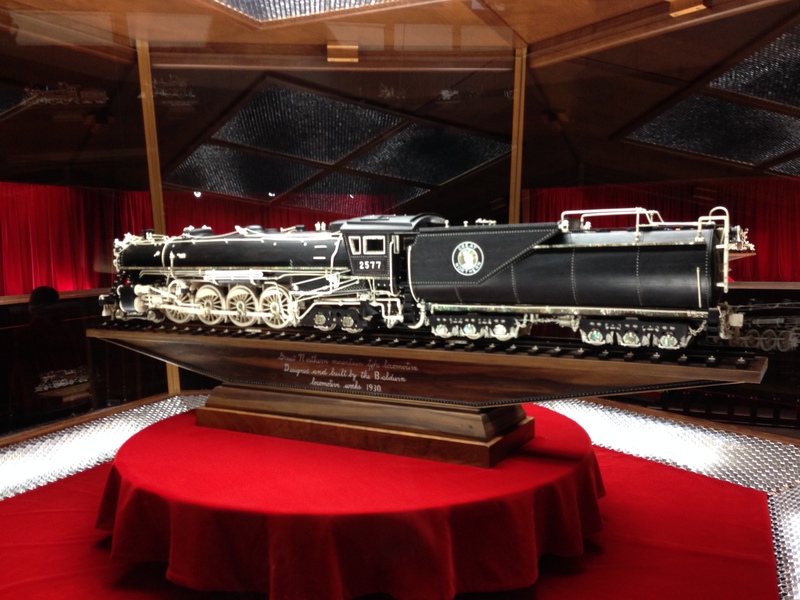 His greatest masterpiece, the 1933 Great Northern locomotive, has 7,752 pieces – all carved by hand. He carved 50 models for a traveling show that ended up at Grand Central Station in NYC for several months after the trip across the states. Train engineers were flabbergasted at the precise measurements to scale. Locomotive executives offered to buy the exhibit for a staggering sum, but Mooney turned down the offer, wanting to keep his work together. He had been making kitchen knives for his mother and her friends, and decided that this was how he would make his money. His wife Freida, was also full of passion. 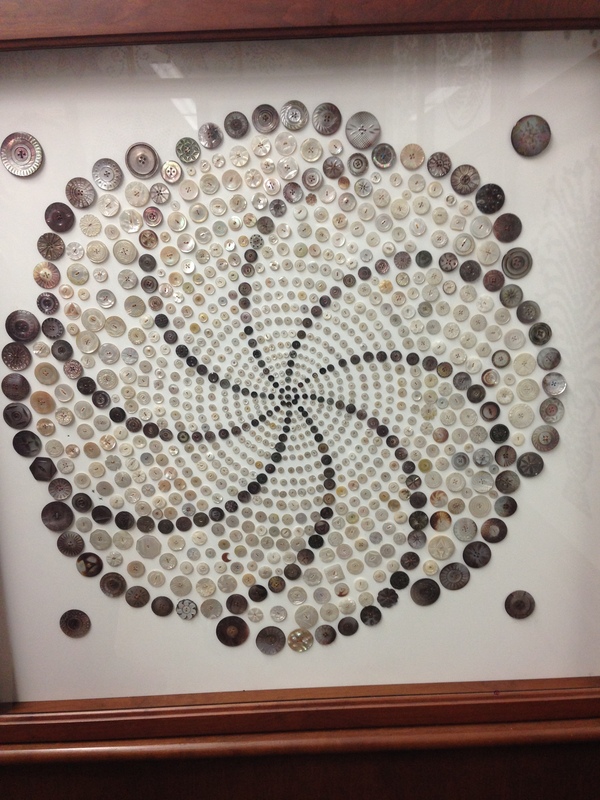 While Mooney whittled away, she created artwork from her collection of 73,000 buttons. 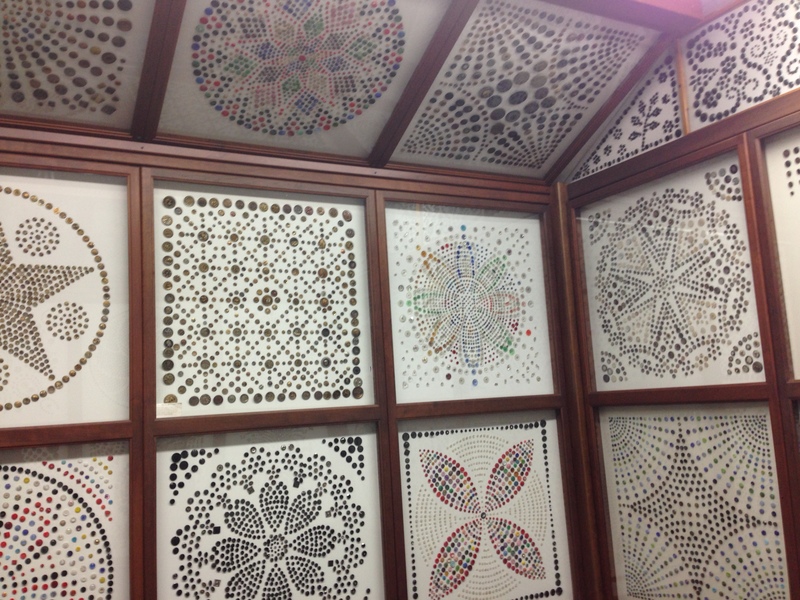 Her entire studio is covered from floor to ceiling with her geometric designs. 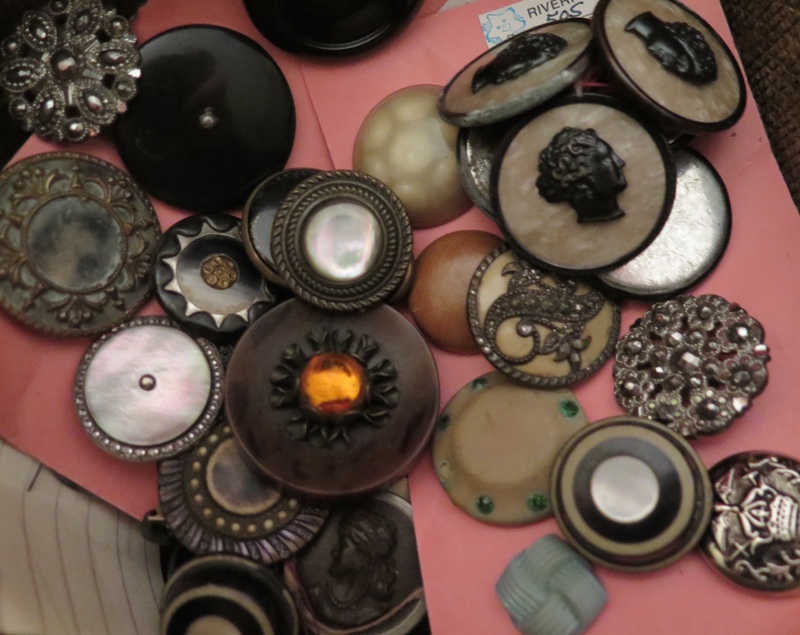 My years as a fashion designer has left me with a love of buttons…..along with a respect of what it takes to sort through and organize them. I still have dreams about buttons: pearl buttons, gold buttons, horn buttons, DTM buttons, boxes and boxes and boxes of buttons. Yet Frieda didn’t stop there. 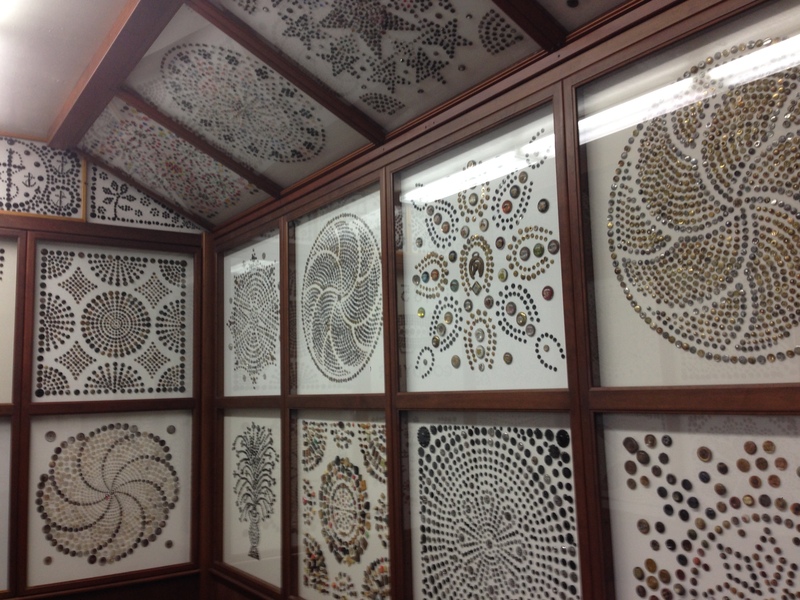 She also decided that Mooney’s workshop could use some tidying up and took it upon to organize his arrowhead collection. 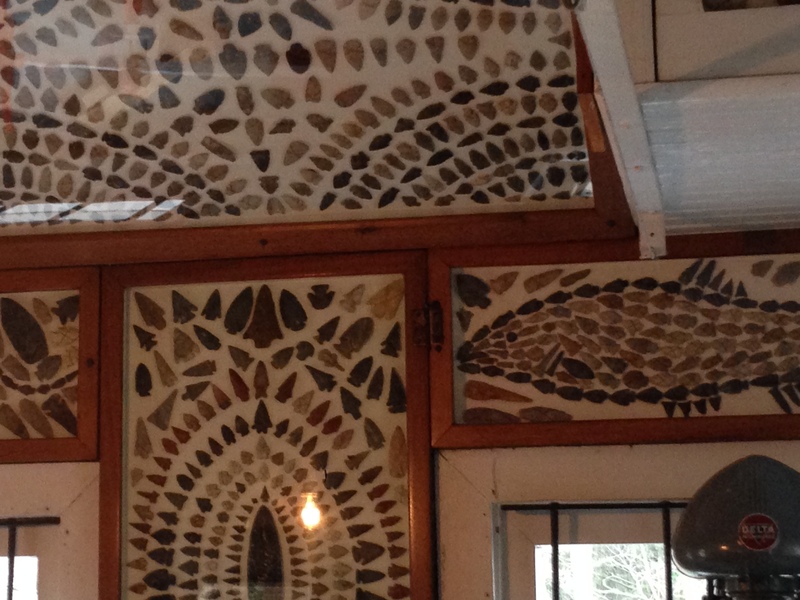 Found on their property and in the neighboring vicinity, she lovingly created art using the arrowheads that he could enjoy as he worked in his woodshop. The Warthers both lived their lives to the fullest following their very unique passions and in the process created brilliance from the mundane. Although I believe my button collection will be happiest left in the boxes they now call home, I’m inspired to take a closer look at my life to see where I can explore, unbutton, and bring to light that very unique part of me. 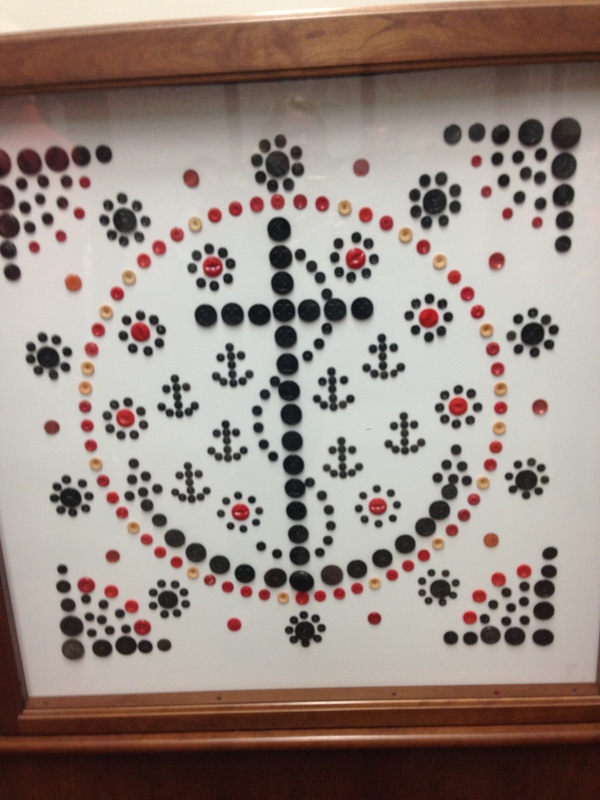 Dedicated to Marni M., who never complained as she sorted through the hundreds of boxes of buttons at the office for me. Was thinking of the Wall of Buttons the whole time – Thanks for being there for me! This is so interesting! Thank you for the reminder that the potential for design is everywhere. Sue I recognize some of your buttons!! Your buttons have given new life to some of my old blazers, and sweaters that needed a fresh look!!! Oh the patience she must have had! !